Sever's syndrome is a painful heel condition that affects growing adolescents between the ages of nine and 14. In this condition, the growing part of the heelbone grows faster than the tendon that connects on the back of the heel. This tightens up the tendon and creates tension where it attaches to the heel. Eventually, the tension causes the area to become inflamed and painful. Fortunately, the condition is not serious. It is usually only temporary. Youth who play running and jumping sports are most prone to this problem. Sever's syndrome used to happen mostly in boys. But with more girls playing sports, boys and girls are now affected equally. Both heels hurt in more than half the cases. What part of the heel is affected? This unique condition is part of a category of bone development disorders known as osteochondroses. (Osteo means bone, and chondro means cartilage.) In normal development, specialized bone growth centers (called growth plates) change over time from cartilage to bone. The growth plates expand and unite. This is how bones grow in length and width. Bone growth centers are located throughout the body. As the bones of the leg begin to grow longer, they sometimes grow at a faster pace than the Achilles tendon. The Achilles tendon is then too short. It begins to put tension on the back of the heel. 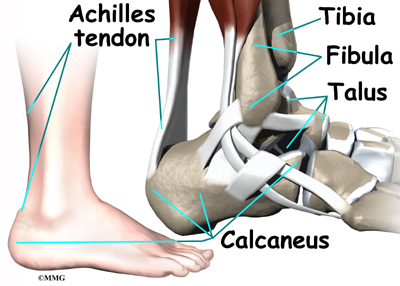 When this happens in kids who are active in running and jumping sports, pain occurs where the Achilles tendon attaches to the heel. Other factors have a role in the development of Sever's syndrome. Kids with tight hamstring and calf muscles seem to have a greater risk for the condition. The problem is compounded when they play sports on hard surfaces, such as playing soccer on hard outdoor fields. The constant impact can disrupt the bone growth centers in the back of the heel, causing inflammation and pain. The back of the heel may appear red and swollen. It will probably be tender to the touch. Squeezing the heel is painful. The heel tends to hurt during activity and feel better with rest. The heel and foot may feel stiff, especially first thing in the morning. The calf muscles and Achilles tendon may also feel tight. The history and physical examination are usually enough to make the diagnosis of Sever's syndrome. The doctor will need information about the age and activity level of the child. The doctor will press on and around the back of the heel and may even squeeze both sides of the heel to see if there is any tenderness. The doctor will compare both heels. The doctor may also ask the patient to rise up on the toes. This makes the calf muscles work, which puts tension on the Achilles tendon. Pain during this test can help the doctor make the diagnosis of Sever's syndrome. X-rays aren't that helpful in diagnosing Sever's syndrome. The X-ray may appear to show small cracks within the bone at the back of the heel. However, even kids who have no pain at all may seem to have these cracks on X-rays. The cracks are the bone growth center and are normal. Doctors may order an X-ray anyway to make sure there are no other problems, such as a fracture. In some cases of Sever's syndrome, the patient may need to stop sports activities for a short period. This gets the pain and inflammation under control. Usually patients don't need to avoid sports for a long time. Sometimes, the passing of time may be all that is needed. 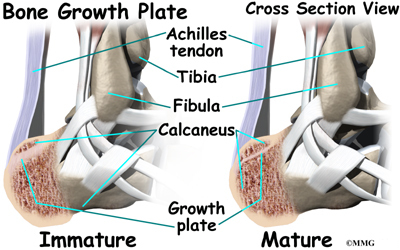 It takes one to two years for the bone growth plates that make up the back of the heel to grow together and form one solid bone. At this point, pain and symptoms usually go away completely. The doctor may prescribe anti-inflammatory medicine to help reduce pain and swelling. A small lift or pad placed under the sore heel may help, too. The lift angles the foot down slightly. This angle relaxes the Achilles tendon and reduces stress where the tendon attaches on the back of the heel. The doctor may also suggest working with a physical therapist. Physical therapists might use ice, heat, or ultrasound to control inflammation and pain. As symptoms ease, the physical therapist works on flexibility, strength, and muscle balance in the leg. The therapist may also design special shoe inserts, called orthotics, to support the arch and take tension off the Achilles attachment. Taping the arch is an option when orthotics won't work, such as in footwear used by gymnasts and ballet dancers. Children with Sever's syndrome should avoid running on hard surfaces. Running barefoot should be avoided. The impact worsens the pain and inflammation. Cortisone injections are commonly used to control pain and inflammation in other types of injuries. However, a cortisone injection is usually not appropriate for this condition. Cortisone injections haven't shown consistently good results for Sever's syndrome. There is also a high risk that the cortisone will cause the Achilles tendon to rupture. In severe cases, when other forms of treatment don't give relief, doctors may recommend a walking cast for six to 12 weeks. The goal is to stop the foot from moving so that inflammation and pain go away. The symptoms of Sever's syndrome usually disappear when the growth plates in the heel grow together. Surgery is not generally an option for Sever's syndrome. In nonsurgical rehabilitation, the goal is to reduce pain and inflammation. Nonsurgical treatment can help ease symptoms of Sever's syndrome. Some doctors have their patients work with a physical therapist. Therapists also work on the possible causes of the problem. 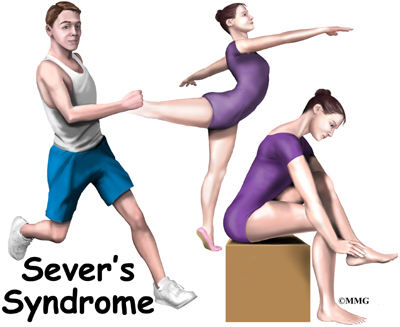 The major treatment for Sever's syndrome is stretching exercises for the Achilles tendon. Ice is often applied after the stretching program for up to 20 minutes. The stretches and ice treatments reduce tension and inflammation. It is also important to stretch the hamstring and quadriceps muscles. This can help reduce tension in the Achilles tendon where it attaches to the heel. Orthotics are sometimes issued to put the leg and foot in good alignment. Therapists work with young athletes to help them improve their form and reduce strain on the heel during their sports. When symptoms are especially bad, patients may need to avoid activities that make their pain worse, including sports. Symptoms from Sever's syndrome tend to go away slowly over time. This means nonsurgical rehabilitation doesn't really cure the problem. Treatments only help by giving short-term relief.